The Lymphoma Treatment Program at the Hyundai Cancer Institute at CHOC Children’s is dedicated to providing its patients with the non-Hodgkin lymphoma, Hodgkin lymphoma and recurrent lymphomas with the latest treatments available. Our expert team offers specialized pediatric protocols that are developed at the Cancer Institute and not offered elsewhere. Each treatment is customized to meet the specific needs of the patient while also balancing the social and emotional needs of the patient and family. Treatments are based on the type and stage of the lymphoma, as well as the most current international protocols and research. Our lymphoma team knows that a cancer diagnosis can be stressful and frightening. 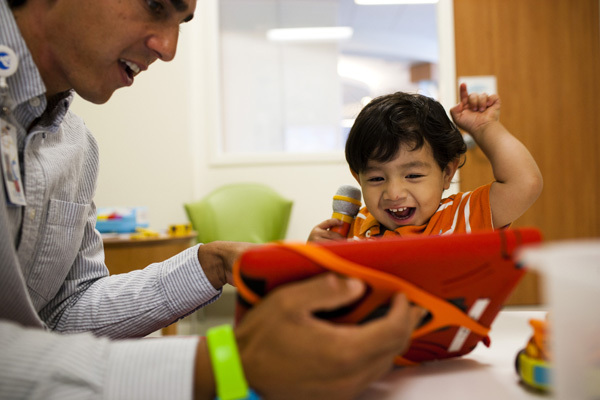 Our specialists are dedicated to providing the care, compassion and open communication patients and their families need. As part of their dedication, they make sure that all new patients are seen within 48 hours of being referred by their physician. We specialize in treating Hodgkin and Non-Hodgkin Lymphoma. The Lymphoma Treatment Program is a multidisciplinary team of lymphoma experts. 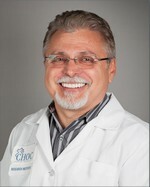 The team is led by Ivan Kirov, M.D. who is a board-certified pediatric hematologist/oncologist. He earned his medical degree from the Medical Academy in Sofia, Bulgaria in 1979. He did his residency and fellowship in Bulgaria where he went on to become an accomplished pediatric hematologist/oncologist for more than 12 years. In 1992, Dr. Kirov moved to the United States and became a visiting fellow in the bone marrow transplant program at the Johns Hopkins Hospital Oncology Center. He then went on to complete a residency in pediatrics at Westchester County Medical Center and postdoctoral fellowship in pediatric hematology/oncology at CHOC Children’s. Learn more about our exceptional pediatric oncology-trained nurses, social workers, psychologists, nurse practitioners, child life specialists and case coordinators at the Cancer Institute. We understand that a cancer diagnosis is overwhelming. To make the treatment process a little less confusing, the Lymphoma Treatment Team has put together this list of frequently asked questions and answers to make the process a little easier to discuss with family and friends. These questions should not replace the instructions and information provided by your child's treatment team. Lymphoma is a cancer of lymphocytes in which the cell divides and grow abnormally. The abnormal cells grow into a large collection cells and when that collection of cells is big enough they can be felt or seen on an x-ray or scans. When this occurs, a biopsy is done to determine the exact kind of lymphoma. What are some of the different types of lymphoma? There are two main types of lymphoma. Hodgkin disease mostly affects people in their teens or early twenties, as well as people in their fifties. Non-Hodgkin lymphoma (NHL) is a term applied to number of different types of lymphatic cancers. Once a biopsy is done, more specialized tests are done to determine the exact make up of the tumor. The type of NHL will determine the treatment the patient will need. There are many types of non-Hodgkin lymphoma, and treatment is based on the exact type of lymphoma. Burkitt’s lymphoma is a non-Hodgkin lymphoma, Although it grows quickly, it is curable in a high percentage of people. Burkitt’s lymphoma grows predominantly in children and is also known as small non-cleaved cell lymphoma due to the distinct look of its cells under a microscope. Lymphoblastic lymphoma is a high-grade non-Hodgkin lymphoma and is the most common lymphoma in children. Most of these lymphomas (80%) are T-cell lymphomas and the remainders are B-cell lymphomas. When a pathologist examines the lymphocytes under the microscope he or she can identify whether they are T cells or B cells. Lymphoblastic lymphomas occur predominantly in males and when found in adults typically occurs between 20 and 30 years of age. Most of the lymph nodes grow in the mediastimun (the front of the lungs). Sometimes lymph nodes in the chest become involved and the patient could experience a cough, shortness of breath or chest pains. Many people with lymphoma won’t have any symptoms. Lymphomas are diagnosed mostly by taking a small piece of the lymph node involved (biopsy) and sending it to the pathologist. The pathologist will then do special tests to determine the exact type of lymphoma. Other tests include a bone marrow aspirate and/or biopsy that will show whether the lymphoma is also in the bone marrow. This is done by a hematologist/oncologist who specializes in the treatment of people with cancers and blood diseases. It involves inserting a needle into the cavity of the back of the pelvic bone and withdrawing a small amount of liquid marrow. Another needle is inserted into the same space and a small cylinder of bone is removed which then goes to the pathologist. The child is lightly sedated for the procedure and typically feel no pain afterward. Lymphoma is most commonly treated with a combination of chemotherapy and radiation therapy. Chemotherapy involves the use of medications to treat cancer. A variety of medications are given, in combination, to kill tumor cells. The exact combination of chemotherapy agents used depends upon the stage of the disease. Radiation is the use of x-rays to kill or damage rapidly growing cells like tumor cells. Radiation may be given before or after chemotherapy. Patients exposed to radiation may experience redness or increased pigmentation of the skin. The side effects of radiation depend on the area of the body treated. These effects usually clear up after treatment. What are some of the side effects from treatment? Some patients experience more side effects than others, but this does not mean that they are treated any differently. Chemotherapy can cause upset stomach, nausea, vomiting, hair loss, low blood counts due to anemia, and increased susceptibility to infections and may require blood and platelet transfusions. Red blood cell transfusions help to increase the amount of hemoglobin, the oxygen carrying component of blood. Platelets may also be needed if the platelet count is too low. Platelets prevent serious bleeding and help with blood clotting. Donated blood products are vigorously screened. Any donor with a history of high-risk behaviors is not permitted to donate blood at any time. All donated blood is screened for HIV and hepatitis before it is released for transfusion to a recipient. What should my child/family tell others about the diagnosis? It is important to let others know that lymphoma is not contagious and that it is a cancer of a part of the immune system called the lymphatic system. It is also important to always check with those coming in contact with you to make sure they have not been sick or around anyone else who has been sick in an effort to keep the patient healthy. Are there any short-term or long-term effects of lymphoma? As with any cancer, prognosis and long-term survival can vary greatly from child to child. Every child is unique and treatment and prognosis is structured around the child. Continuous follow-up care is essential and side effects of radiation and chemotherapy, including second cancers, can occur in lymphoma survivors. New methods are continually being discovered to improve treatment and to decrease side effects.